Restore Your Smile Naturally and Seamlessly! It doesn’t matter how tooth loss occurs. Whether it is caused by injury, poor dental hygiene, health factors, or anything else, finding a secure replacement is of the utmost importance. Dental implants in Benbrook are the only comprehensive solution following the loss of one or more teeth. Dr. Givan provides dental implant care in our state-of-the-art office; contact his office to schedule your next consultation! The benefits of dental implants are numerous and significant compared to non-implant retained options in tooth replacement. First, dental implants look and feel just like the rest of your teeth, which allows you to eat, speak, and smile with full confidence once again. Dental implants also promote better oral health. Our bones need stimulation to thrive -- but after you have lost a tooth, you are missing the root that provides this activity for the jaw. By replacing the tooth’s root, the dental implant keeps your jawbone healthy and whole for a lifetime to come. Then there is the lifespan to consider. Dental implants can last for decades with proper care, while dentures lose their fit and need to be replaced every six or seven years. Ill-fitting dentures are uncomfortable, stressful, and cause oral sores, which have been linked to oral cancer. Dental implants secure a denture without the need for messy adhesives, allowing you to live without the stress that your denture will move around or fall out at an inopportune moment. How are dental implants placed? The procedure is broken up into two stages: initial implantation and final restoration. A recovery of several months is needed in between. Implantation: Performed under local anesthesia and other sedation as needed, the gum is opened and the dental implant is buried beneath. Recovery: In between the first and second stages, the dental implants and jawbone will gradually fuse together in the process known as osseointegration. The recovery period lasts from four to eight months. Restoration: After osseointegration is complete, the dental implant is secure in the jawbone. A connecting abutment is placed on top of the implant, and the prosthetic tooth is attached to the abutment. Because dental implants are surgically placed, patients should be able to recover from an invasive procedure to be eligible candidates for the tooth replacement. People with health conditions affecting the immune system may need to consider a non-implant supported option. Dental implants also require plenty of healthy bone and gum tissue for successful anchoring. Severe cases of periodontal disease should be treated in advance of implant dentistry. Bone augmentation procedures can create more space in a weak jawbone. 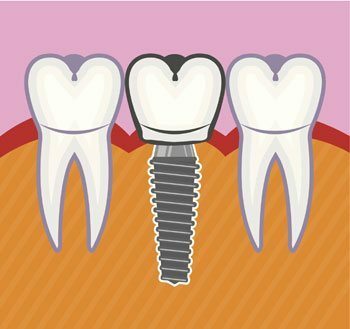 A single dental implant consists of a small titanium post that is surgically implanted beneath the gum line. Here, it acts as a prosthetic root for the tooth replacement that is attached with a connecting abutment and porcelain crown. While a dental implant can support a single crown, multiple dental implants retain a bridge. Instead of relying on natural teeth to anchor a restoration like a traditional bridge would, implant-retained bridges use an implant on either side of the restoration. If you’re missing an entire arch, you’ll be happy to learn that dental implants can easily accommodate a full or partial denture. By placing several implants strategically throughout the jaw, your next denture can benefit from improved stability and appearance, regardless of which arch you need to replace. The cost of your dental implant tooth replacement varies depending on your unique treatment plan. The bulk of the cost is in the implant posts and their surgical placement. In addition to the costs of the implants and their surgical placement, you also need to keep in mind a variety of other factors that can impact the overall price of treatment, including preparatory procedures like tooth extraction, sedation dentistry, and your replacement tooth or teeth. With that said, dental implants are designed to be a long-term solution to tooth loss. As a major investment, they are meant to be more cost-effective compared to bridges and dentures, which both carry a shorter lifespan overall. Implant dentistry is the comprehensive solution following tooth loss. If you would like to discuss your eligibility for dental implants in Fort Worth, don’t wait to get in touch with Dr. Givan. Request an appointment online today!